This third week of February 2016 the Smelt Working Group concluded “the risk of entrainment remains high and it is incompatible with current pumping levels”1. 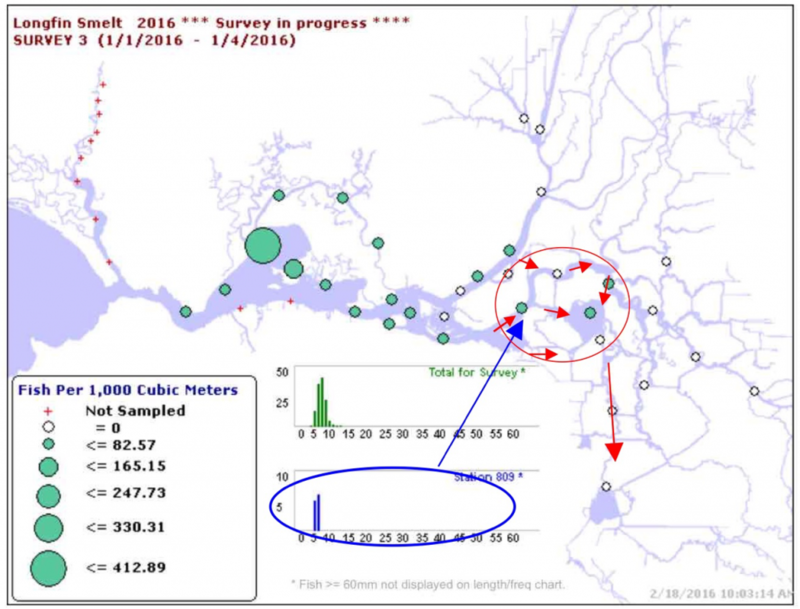 Basically as Delta inflows decline after the early winter stormwater recedes in early February and South Delta exports increase, the risk to Delta Smelt is high with the onset of spawning imminent. Despite the high risk assessment, state and federal managers have decided to raise exports to the maximum allowed under the Delta Smelt Biological Opinion, to 6,000 cfs, which is triple the 2000 limit suggested by the working group, and about a third of Delta inflow. The working group warns the managers that just because there are few smelt being seen in Delta surveys does not mean that the remnants of the populations are not at risk. The working group is also concerned with what may soon occur once smelt do start spawning. As Longfin Smelt have begun spawning, I have summarized recent data to specifically look at that risk. 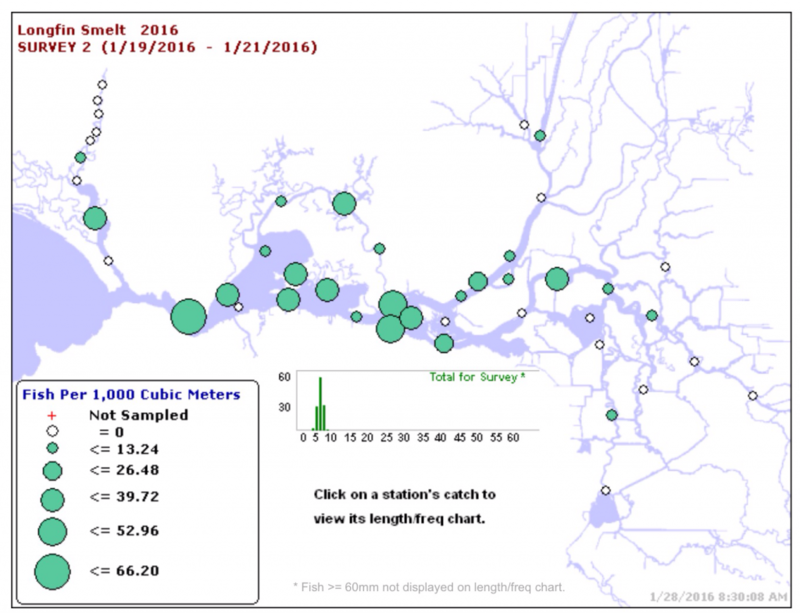 Figure 1 shows the recent early February Smelt Larval Survey results along with annotations of net flows. 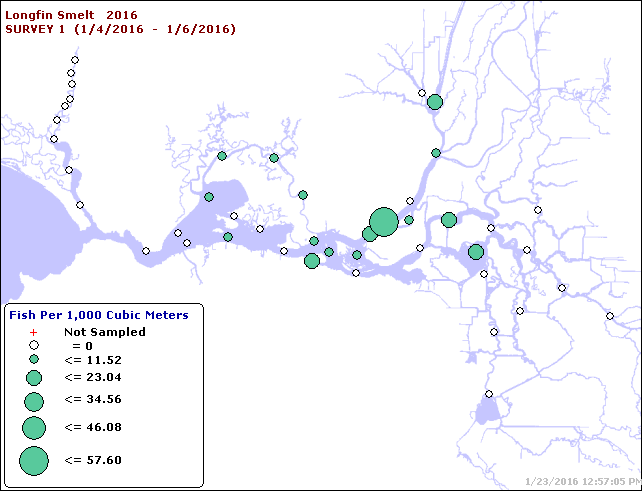 Under 6000 cfs exports negative upstream net flows occurs throughout the central Delta (red arrows). The larval smelt in this area will transport to the south Delta over time. With spawning smelt in this area, their offspring will also likely move south to the pumping plants. With most of the larval Longfin in Suisun Bay because of the earlier storm flows, the risk to the population is low. Yet, these are a state endangered species with these export operations causing a measurable take. With Delta Smelt yet to spawn, they are more likely to be found further upstream because of lower Delta inflows, thus putting their larvae at greater risk than Longfin, especially given ripe adults are present in the central Delta. One final note, with these operations and declining Delta inflow, the low salinity zone where smelt larvae concentrate will be drawn ever eastward from eastern Suisun Bay into the central Delta. This pattern will increase the risks to smelt. The upstream edge of the low salinity zone is moving upstream in the lower San Joaquin channel with the higher exports as seen at Antioch (Figure 2) and False River (Figure 3). 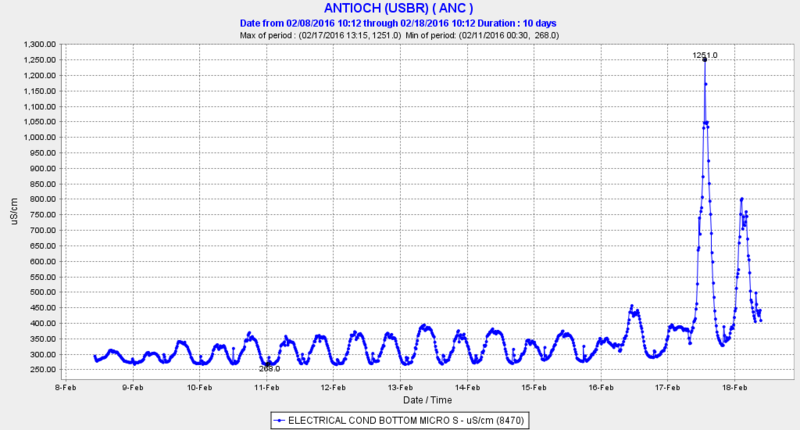 A recent Fishbio post focuses on the problems with hatcheries.4 As in most posts (even mine), there is room for debate. Improve coordination of operations among hatcheries (CAHSRG 2012). While the state hatcheries do raise some “advanced” smolts for release into the Bay in late spring for the commercial fishermen, these fish are “advanced” only in the sense they are reared longer in the hatchery to a larger smolt size with greater chance of contributing to the commercial fishery along the coast after release in the Bay. The vast majority of the 30 million smolts raised in Central Valley hatcheries are “normal-sized” 3-inch April-May smolts, which in many cases are actually smaller and later ocean-entry than the wild salmon that enter the estuary as December-February fry-fingerlings and enter the ocean as smolts in March-April a month before their hatchery counterparts. The fact is that stocking has become more diversified than ever. 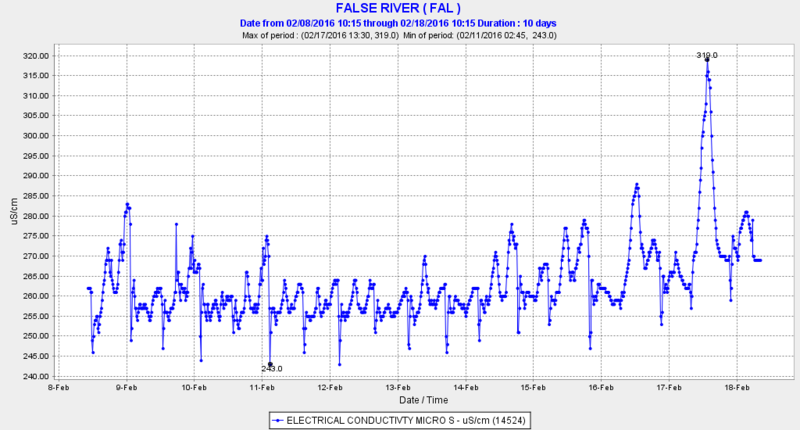 Millions are released at the hatcheries and in the mainstem rivers below hatcheries, often coincident with storm flows and good Delta conditions. Millions are released over the spring months directly into the Bay. The “advanced” smolts are usually released in June. In wet years, more are released in rivers, and in drought years, more are released in the Bay. Winter, Spring, Fall, and Late-Fall Run smolts are released at different times and places. Each hatchery has its own schedule to maximize use of the common resources (e.g., personnel, trucks, pens, ramps, etc.). Hatchery programs are now more “informed” and better managed and coordinated than ever before, and making concerted efforts to continue to improve. Without the hatchery efforts in the past decade of drought, there would be few salmon left for sport and commercial fisheries. One of the greatest challenges for California fisheries management in the next decade is to continue to improve hatchery practices while also restoring wild salmon runs, so that the wild fish are not only kept from extinction but also contribute substantially to sport and commercial fisheries. Don Beyer and many others are concerned with the recent movement to limit hatchery production and mark-selective fisheries of Steelhead in the Puget Sound and Columbia River regions in Washington State. At the center of the debate have been proposals to eliminate hatchery programs on rivers with wild Steelhead.1 Typically, WA Steelhead fisheries focused on winter hatchery fish (adipose fin clipped), with catch-and-release of wild non-clipped fish in winter and spring. 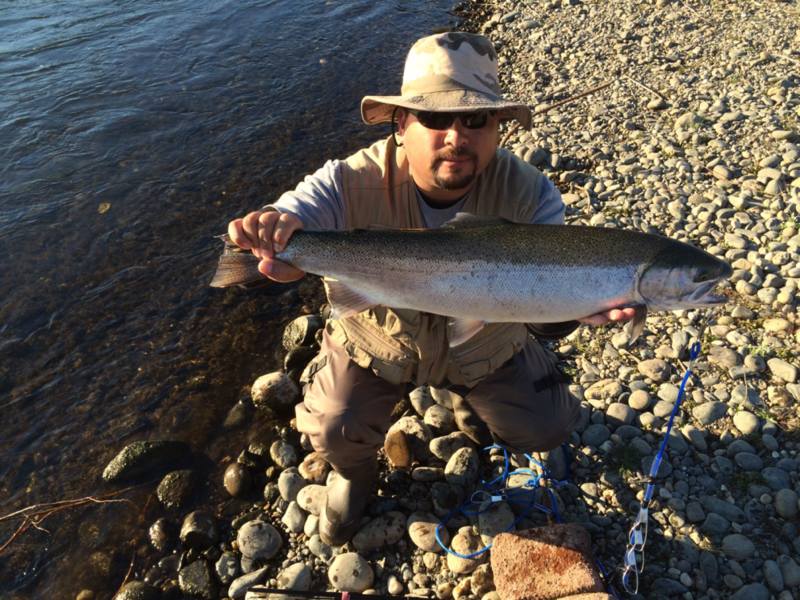 In recent years, popular mark-selective and wild catch-and-release fisheries have been shut down on rivers in WA with seemingly healthy populations of wild Steelhead.2 Will NMFS extend these strategies to California? Salmon and steelhead hatcheries have been in existence for decades along the Pacific coast. The purpose of these hatcheries has been to maintain or improve fisheries for sport, commercial, and tribal interests. They are also a key factor in providing mitigation for habitat losses due to water resource projects such as dams, urbanization, land use alterations, and pollution which have negatively impacted wild fish populations. Hatchery fish are utilized for food consumption by not only humans, but by marine mammals (e.g., Orcas, seals/sea lions, porpoise/dolphins), birds (bald eagles/ospreys/herons), and other fish (e.g., bull trout), many of which are protected under the Endangered Species Act (ESA), Marine Mammal Act, or other similar Federal acts. The sport fishing industry that has developed over decades around fish resulting from hatchery programs also has a very large economic impact involving millions of dollars. As a result of the ESA and its efforts to protect non-hatchery raised salmon or steelhead, it was difficult for fishermen to distinguish between hatchery and non-hatchery fish and it appeared that harvest would need to be strictly curtailed or eliminated. To resolve this challenge, hatchery fish were required to be clearly “marked” so that they could be differentiated from non-hatchery fish. The most widely adopted approach has been to remove the adipose fin (a small non-functional fin near the tail of the fish) in juvenile fish before they leave the hatchery to migrate to the ocean. In this manner, if a fisherman caught a salmon or steelhead with an intact adipose fin, they were required to carefully release the fish (even if the season was open for that species). This approach (termed “selective fishery”) was to allow fishermen to continue fishing while protecting ESA-listed salmon or steelhead. Without this approach, the sport, commercial, and likely tribal fisheries would have ceased to exist. It took many years in all Pacific coast states, along with the efforts of many people, to get the selective fishery approved and implemented. Other approaches are also being undertaken to minimize or eliminate interactions of ESA and non-ESA listed fish. For example, in the past, steelhead from Washington state hatcheries were released at the hatchery and often at other locations either upstream, downstream, or even other river systems. To minimize potential interactions with ESA-listed steelhead, this practice has been minimized to releases only at the hatchery. This takes advantage of the exceptional homing abilities of adult hatchery fish to return to their place of origin (i.e., the hatchery), thus reducing the interactions with non-hatchery fish. Without the adipose-marking of fish, current fisheries would not be able to continue because fish protected under ESA could not be differentiated from hatchery fish. As such, a major food source for humans and other ecosystem components (e.g., those mentioned above) would cease to exist along with the loss of a major industry dependent on hatchery production. Without selective fishing, the only possibility for a return to a harvestable level of fish would be for ESA-listed species to recover to a level of sustainability that includes harvest. This is a long-term undertaking and may not be possible in some areas where the habitat would not sustain recovery. However, in some situations such as the Columbia River system, progress is being made through recovery of habitat, improvements in hydroelectric and hatchery programs, and harvest restrictions. On the latter, the selective fishery approach has allowed a very viable sport, commercial, and tribal harvest to continue. Watershed: New Insights to Support Conservation and Management,1 put the onus on sport fishermen to save Central Valley sturgeon. Contributors suggested that to maintain a healthy population of white sturgeon, mortality of adult females has to be eliminated, sport fishing harvest of adults should be halted, and sport fishing should be confined to no more than catch-and-release, with no fishing during the spawning season. The contributors also noted that strong year classes of sturgeon only occur in wet years when young survival is high. The 2006 year class was the last year class to contribute strongly to the adult population. Essentially what they are saying is that survival of young is so poor and intermittent that recruitment into the adult population is too low to allow any sport fishing harvest. Of note, there was no mention whether the number of adults spawners has been or is now a limiting factor in the number of recruits produced in the very wet years. Such a state would indeed be a great concern. If the number of eggs laid in very wet years with the present adult population was insufficient to saturate the existing spawning and rearing habitat with young, then the population would be on an accelerated path to extinction. However, if the number of eggs laid is sufficient to saturate the habitat and recruitment (survival of young) is only a function of habitat conditions, then the reason for poor recruitment is not over-fishing but poor or degraded habitat. The intermediate condition where both factors are important is possible if not likely. How the fishery should be managed would also be different in the three conditions. Also important are any changes in the trajectory of the habitat conditions. If habitat is being gradually degraded by man’s direct effects or climate change, that too can drive the population downward by reducing the production capacity of habitat or increasing the natural mortality of sturgeon. Sport fishing harvest has to be sensitive to such changes, if only to being falsely blamed for any decline or accepting a need to change even to the point of mitigating for the other effects. Based on the symposium and its summary paper it appears that the onus has been put on sport fishing as the cause as well as the solution to declining sturgeon populations. There was little mention about the effect of habitat conditions (other than the historical imposition of dams). There was mention of stranding and rescue of sturgeon in the Valley bypasses. 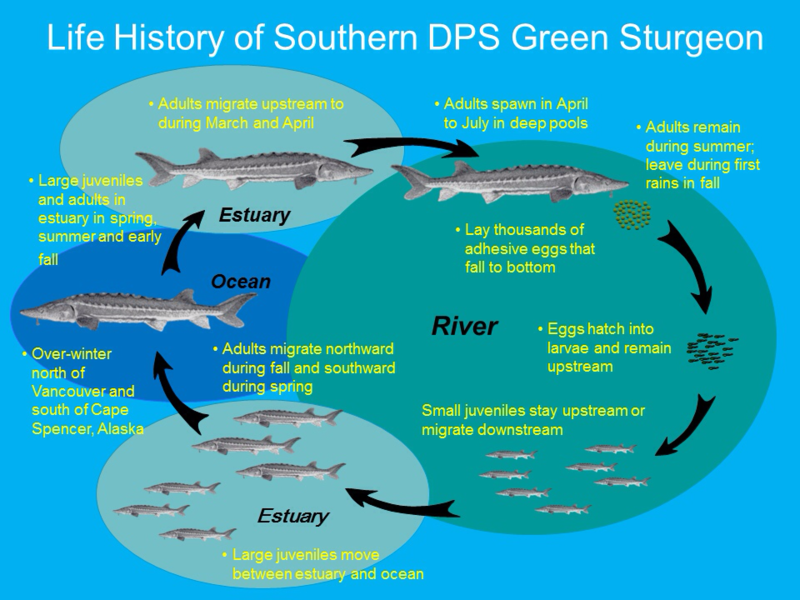 “An individual-based model indicated that in the absence of rescue, the current population of green sturgeon in the river would have declined by 33% over 50 years (Thomas et al. 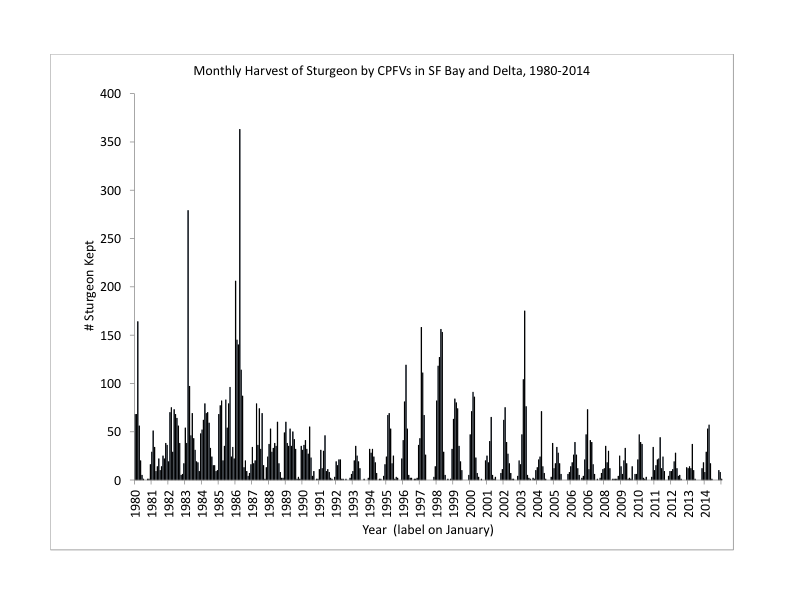 2013).” This anecdote was offered more as evidence that harvest should be curtailed as opposed to being a major factor in the decline that should be fixed. 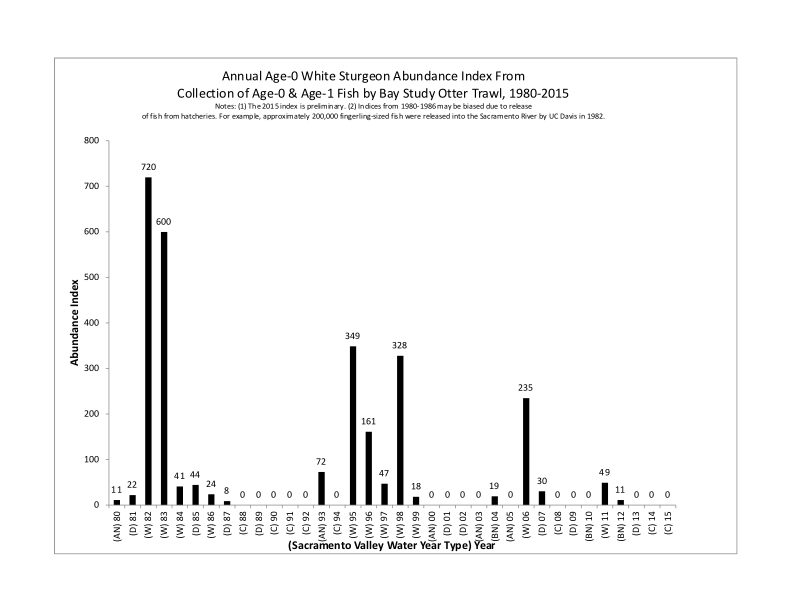 The fact is that large numbers of adult sturgeon get “lost” or become stranded or die in the Yolo and Sutter bypasses and in the Colusa Basin Drain each year, especially in wet years when their eggs are most needed. There was discussion of juvenile survival. “[L]ittle is known of the swimming capacities of larval sturgeons, though the risk of larval sturgeon entrainment is likely influenced by both the ontogeny of swimming capacity and the interactions of sturgeon with water diversions. There were three primary conclusions and associated recommendations from the symposium. Protect and restore critical key habitat in order to conserve and reestablish to conserve and reestablish sturgeon populations. Gravel beds are critical for successful spawning and egg survival. Deep holes are critical as energetic refuges for sturgeon holding in the river.Comment: No mention was made that many of these key spawning habitats are degraded in dry years by low flows and high water temperatures in the late spring spawning season. Demersal adhesive eggs and hatched young are subject to lethal water temperatures (>65oF) in dry years.4 Low flows also contribute to starvation, predation, and reduced downstream transport. Take a holistic approach to life history and habitat research and monitoring. This should include a robust program of conventional mark–recapture to determine population size, population year–class composition, and mortality rate—in addition to advanced telemetry and habitat mapping methods. This approach should also include continuous monitoring of dissolved oxygen, the most critical environmental factor for oxyphilic sturgeons: they are broadly tolerant of wide ranges in temperature, salinity, and flow that are all much less critical factors for their population success. Comment: Water temperature, flow, entrainment, and predation are the key factors of poor recruitment (survival) in non-wet years. These factors are far more important for sturgeon in the long run than the harvest of several hundred adult sturgeon each year from a population of 25-50 thousand adults. Similarly, Longfin Smelt are at record low numbers (see latest post6), and larvae are now being collected in small numbers (again record low densities for January surveys) in Suisun Bay and the Delta (Figures 3 and 4). Their presence in the central Delta in the lower San Joaquin River channel indicates that a portion of the population spawned in the central Delta and remain vulnerable to South Delta Exports.